…always moves front and center when life gets busy and seemingly spins out of control. Every year this time appears to be booked tightly with one event following another and little time to catch my breath. I feel particularly pressured when a migraine appears out of nowhere. Last week one such monster headache arrived with the strong spring winds that melted the ice (and also brought with it an amazing Aurora Borealis event). I am managing with a little more efficiency today. In the background my printer is working overtime to produce the handouts needed for my workshops at the Sunshine Coast on May 1st and 2nd. The printer noise always makes me a little calmer. It helps me focus and aids in organizing my thoughts as I project into the future and, more importantly, which samples to pack. I am sure you are not really interested in my mundane workshop preparations. Thank you for your loyalty – I have a special treat for you. The video below is of Aurora images I captured earlier this week. I set them to music to share. If you have already seen it on my travel blog, just ignore it (or watch it again. 😉 ) Happy Sunday afternoon to everyone! 19 Apr	This entry was published on April 19, 2015 at 1:55 pm. It’s filed under Art, Creativity Update, Journaling, Landscape photography, Nature photography, Nature's Art, Travel, Workshop Opportunity and tagged a special treat, a visual and auditory treat, Aurora Borealis, Aurora video, packing for teaching and travel, Sunshine Coast workshop. Bookmark the permalink. Follow any comments here with the RSS feed for this post. Hi Shelley – thanks for the feedback… I won’t be able to come to Watrous. I had a previous commitment and will be heading to Assiniboia for Saturday for a photo symposium and Colin and I head west on Sunday morning… Things are just heating up. We have a full schedule till mid June. Hope to see you sometime soon! This is spectacular and to catch some of the pink ones also is really precious ! As to balance , from my end Anna, it sounds as if you would be wise to put more ‘rest’ time in your schedule , whatever that would mean for you . 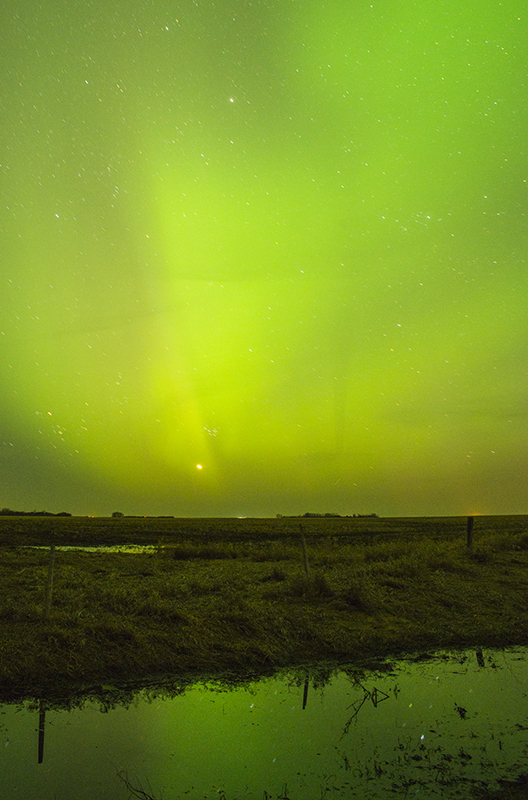 Often in years passed I was awed by the northern lights , mostly when I was young and in The Pas , Manitoba. Until the last couple of years I made that long drive (by myself) sort of a pilgrimage trip of what my husband and kids used to do over the years . The ‘lights’ were wonderful over the lake there . When we lived in Winnipeg they also put on great displays. although I think I remember reading that they do not do that , but I know better . We also saw some lovely displays when in the Yukon. I am sorry to hear that your health has been affected by too heavy a schedule . The telling statement for me is the one which begins with,”somehow everything got out of hand”. I think that is a ‘woman thing’ .Many years back I did some teaching but I found that it interfered with getting my own work done . I also saw or heard of many marriages that went down the hill because of the wife being away so much . I enjoyed it when Mac went with me and we could have a little holiday at the same time . I have found that it is very important to have down or rest time especially within my own space . It renews and refreshes me and my body works a lot better too ! Surprisingly it still is something I can lose track of at times but I usually get a quick reminder from my body ! Thanks for taking the time to provide further suggestions for a more balanced life… I know all “the stuff” – but knowing and applying is not always that easy! My husband travels with me whenever we are within driving distance of a teaching and judging event. But when a commitment takes me to the Eastern US in the middle of winter I can’t justify the time and money invested in finding dog sitters, and extra ticket and hotel expense… especially when a lot of the venues are in areas without opportunities for sightseeing. – We do bring along the camper most trips together and it is always an opportunity to make a little holiday out of the trip, hence the implementation on my travel blog. – I think the most important point is that I am fully aware of the need to slow down. This enables me to more carefully plan my teaching and judging invitations. This year is the third year in a row where some commitments are spaced very close together. I am actively working on reducing my travels to no more than one commitment a month. Thanks for caring, Joyce!